Formed in February of 1992, in Petaluma, California, The Conspiracy is an eight-piece blend of ska, punk, pop, and rock 'n' roll. Strong enough to pass on a few independent label offers, they started up their own Flying Harold Records and released their own album, as well as other bands they were into. 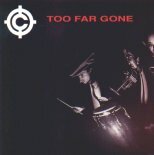 On their debut CD, TOO FAR GONE, they serve up 15 tracks that show their diversity in musical influences. The title track kicks off the disc with some pop-punk meshed with horns. With the percussion work the main focus during the verses, they help portray a bit of a ska feel, but the guitar and vocals help lean the song to the pop-punk side of things. When the horns burst in, you would think the song would take on a more ska-oriented feel, but played over the power of the chorus, they're only purpose is to warm up the song a bit and add some depth. Moving into some ska, "Amoeba Man" shows their ability to blend a pop-drenched chorus with some danceable ska verses. The bass itself will make you want to dance, especially when the rest of the band cuts away and they leave the bass to show its chops for a few seconds. But of course, the rest of the time the bass does a good job of showing its face and making its groove known too. The percussion jumps between a Caribbean feel and some standard snare/cymbal drum work, while the guitar serves up a mid-tempo upbeat, slow enough to not tire you out, and fast enough to let you feed off of it and dance. The horns, although I though their work in the chorus was good, seemed forced and rushed during the verses. Quick spats of horns, they burst into the song and just demand your attention, annoying you within only a few listens. "Dyslexic Blues" starts off with some nice, steady ska that will make you dance. But soon, the instrumental number becomes repetitive and you'll stop dancing out of pure boredom. Near the end, they do try to turn things around with some nice horn work, but it doesn't work. This song shows they have the ability to create good, solid songs, but they need the vocals to help carry them. On the other hand, "Mr. Johnson" showcases a very powerful band with a talent for writing ska numbers you can dance, jump, and sing along with. The vocals are very smooth, fitting nicely in with the music. The horns are sharp, bringing to life every word they back-up, while also helping to give the song some thick muscle. Usually horns help add a soothing touch to the music, but this time they use the horns to add a harsher sound. All the while, the percussion and bass do a great job in the rhythm department, and the guitar has no problems moving your feet. "Her Avenger" helps bridge the two worlds of The Conspiracy, bringing forth a ska-punk number for the listener. Keeping the verses danceable, they lay on the power during the chorus. Jumping from some music that gets you dancing and sweating, they slide right into some punk without you even knowing. The same goes for the conversion back to the verses, very smooth. They have no problem converting from one portion of the song to the other, and it really sounds great. "Six Womynz" is the type of number a band plays half way through their set...it's very poppy and danceable, giving the listener some time to rest, but it also has a strong upbeat for those brave souls who keep dancing throughout the shows. As track thirteen, it serves the same purpose on this disc. Pretty fluffy, and very bouncy, the guitar takes charge and makes sure you have enough to dance with almost all the way through the song. Ending with "8 Ball Oi," the band serves up a rigorous ska number that will have you moving those legs in fast unison, trying frantically to keep up. For a debut release, they sound pretty good. They've got some holes and seem to need more time to develop their skills, but they were definitely ready to put out a disc. This is a solid disc, with some good pop-punk during parts and some good ska throughout. I'll give this disc a B.